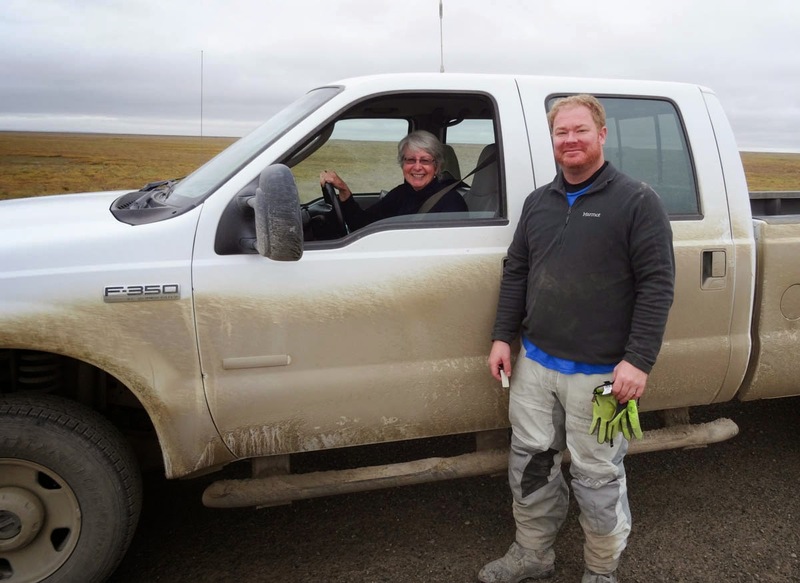 When we first met Andy on the road heading north I assumed that with her big white Ford F-350 and air of self-confidence she was an oil company executive on a mission. Perhaps there had been an case of sexual harassment out at the rig and she, as VP for HR, was going to sort things out. Had that been the case I would not have wanted to be at the wrong end of the issue. But it turned out Andy is a peripatetic adventurer criss-crossing the continent in a yellow Mini Cooper (the pickup was only a rental). This week it was Alaska and her goal the furthest point north she could get. Why was she constantly on the move? Why the hell not? Life’s too short! Over breakfast with her in Deadhorse, Andy suggested we try out a hostel she’d found in Fairbanks and we said, Sure! Sounds fun! We agreed to meet there the following day. Sven’s Basecamp Hostel is run by Sven. Sven who escaped from Switzerland many years before and wound up managing a tidy set of cabins and standing tents for all kinds of vagabonds. 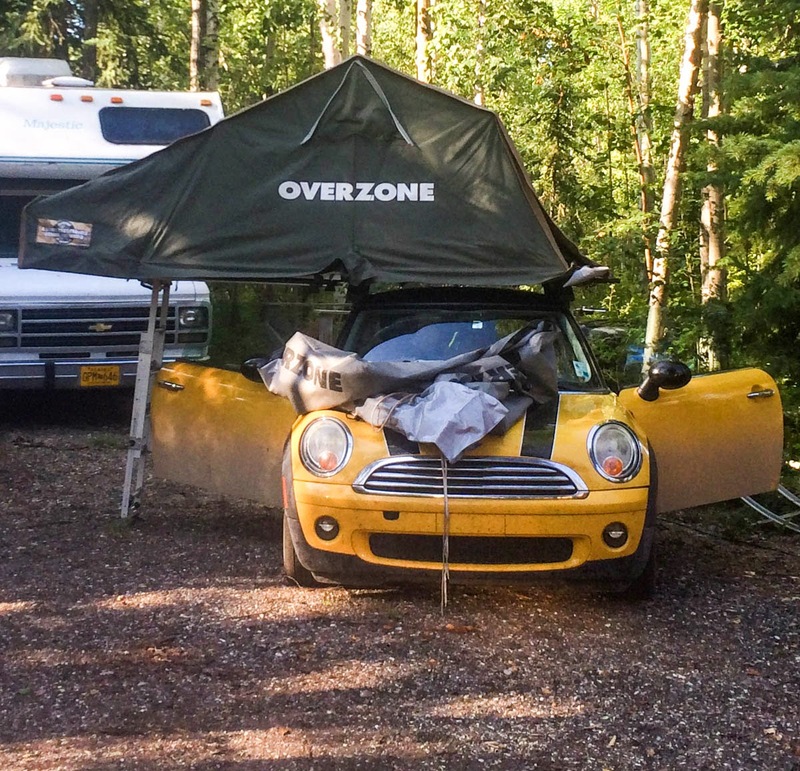 The campers were a cross-section of Alaska’s tourism industry. A set of students and their professors turned up on their way to the Brooks Range for some research. There were several German couples on long-distance expeditions across North America. A group of motorcyclists that came and went en masse. They looked like a tour group. They were far too clean and still carrying stress hangovers that indicated they hadn’t ridden up the AlCan, but instead flown into Anchorage a couple of days earlier. We felt smug and manly with our filthy motorcycles and their lower 48 license plates. The bikes were so dirty that we spent over $20 each at the local spray and wash trying to get the crap off of them. The worst part was soaking off the calcium chloride that’s used to seal the Dalton Highway’s muddy surface. Any time it rains the calcium kicks up in blotchy welts that dries instantly on any hot surface. The exhaust pipes got the worst of it and in the end it took me two days of deconstruction, soaking and gentle washing to get them clean again. Later that afternoon Andy gave us a quick tour of her Mini with its expensive Italian tenthouse suite. 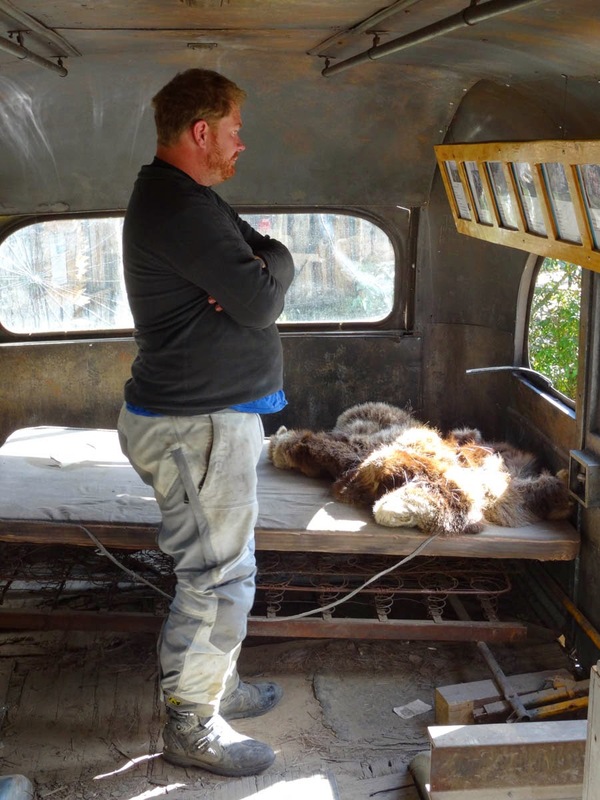 It was pretty cool and for a traveler on a budget a great way to comfortably avoid hotels. Slowly the small contingent of 20-something itinerants swelled and I began feeling my age and more than a little wistful. After dinner a couple of them played quietly on their guitars for a bit as the last sliver of moon rose over the late purples and oranges of twilight. Out in the back forty a bonfire was lit and we passed the Jim Beam around until it was gone and the wood had burned down to embers. The next morning woke us clear and cold with a heavy dew. After breakfast we headed south along the high ridge that runs out of Fairbanks towards Denali. Low clouds clung to the wet road for the first hour or so. The only interruption came as Sledge pulled off to look for the plug end of my tool tube. A tool tube is a homemade tool holder comprising a 4-6” diameter PVC pipe cut to length and hung, somehow, from the bike’s frame. Every design I found recommended a retaining wire for the compression plug that seals it shut. My implementation came up just short enough for us to have to bugger about in the weeds for 10 minutes looking for the lost cap. Which, thankfully, Sledge found. Just north of Denali National Park is the turn off for the Stampede Trail where Christopher McCandless famously walked into the wild. Well, kind of. 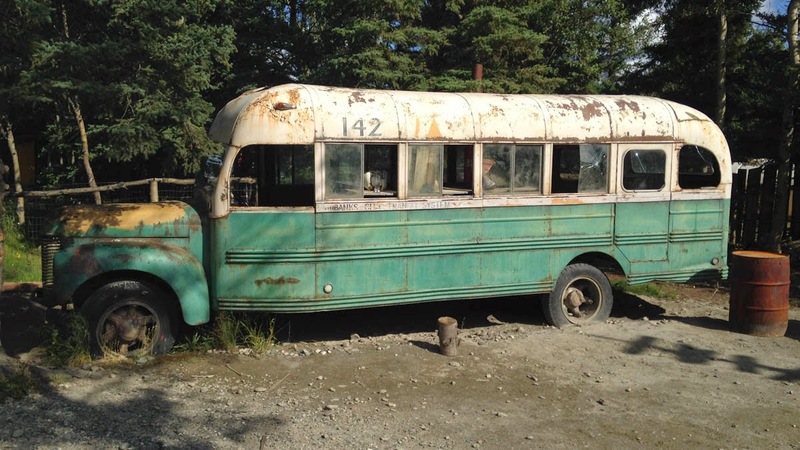 Chris wandered 20 miles up the trail in early spring until he found an old Fairbanks City bus (63°52'05.9"N 149°46'08.4"W) that he made home. He then promptly spent the next three months starving to death. Jon Krakauer, of ‘Into Thin Air’ fame, spins a good yarn and became fascinated with how McCandless met his maker in this bit of wilderness at such a young age. Krakauer’s book ‘Into the Wild’ made McCandless famous and a film by Sean Penn made him a household name. Today pilgrims from all over the world wander up the trail searching for the Magic Bus, some pausing to drown in the Teklanika River along the way. Which I guess is the kind of sacrifice pilgrims are expected to make. You can avoid all that silliness by heading a little further down to the road to the 49th State Brewing Company in Healy. There you’ll find the replica bus that was used in the movie. Inside, the cab is lined with a depressing series of McCandless’ self portraits that show him wasting away to his pointless demise. It was a great film, though. We were riding, not drinking. So after a few selfies we hopped back on our bikes hoping enjoy all the splendors Denali had to offer. Did I mention it was now warm and sunny and a really good day to be alive?